We've known for several months that Mitsubishi was planning to reveal an all-new SUV concept at the 2019 Geneva Motor Show. Given Mitsubishi's recent history of taking historic sports car nameplates and slapping them on dismal crossovers, we didn't have much faith for this Geneva-bound concept. Boy, we were wrong. What you see here is the Mitsubishi Engelberg Tourer Concept, a four-wheel-drive, plug-in hybrid SUV. The Engelberg gets its name from a ski resort in Switzerland known for its grand panoramic vistas. 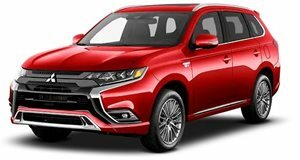 We don't know if Mitsubishi will keep the name for the production version but we would not object to this being the next Montero. This being a plug-in hybrid, the Engelberg can run in hybrid mode or rely on the electric motors by themselves. Mitsubishi is promising an electric range of around 43 miles on the European WLTP testing standard and a total driving range of over 434 miles with the batteries and fuel tank topped up. Like the Nissan Leaf, the Engelberg's batteries can be charged bi-directionally, meaning owners can use the batteries to power their homes. The system is called the Dendo Drive House system and it will likely appear on future Mitsubishi models.